How far do women need to go to escape domestic violence? Well, the question is not about the woman… it’s about the abuser. For a life that is free from abuse – for a life where you can be yourself – women shouldn’t have to go anywhere at all. They should be able to stay put. However, this is often not possible – if the abuser doesn’t change his behaviour, and if nothing is done to make him change. So tens of thousands of women and children have to relocate to escape abuse. A new start in a new area can be really positive. But it can also be really difficult. So it’s an important principle that women should be able to go as far as they need – but not be forced any further – and stay as near as they can – but not live in fear. 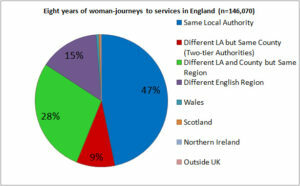 Evidence about women and children who go to services shows that just under half relocate within their local authority. But just over half go further. So, rather than thinking just about local authorities providing services, we need to widen our thinking – to a regional approach. Over 80% of women stay within their region – around 90% for some regions of England. So let’s think more about regions in planning and providing services. Previous Previous post: What about the men?